Universities are all about serious study and preparing students for high-flying careers, but Otago University has acknowledged the fun side of student life. Now meet the world’s oldest all male ballet troupe. Selwyn College was the first Hall of Residence established at New Zealand’s oldest university. The prestigious college cherishes its unique and rich heritage that goes back many generations and reflects its core values of inclusiveness and mutual respect and care. Selwyn College began as a Theological Residential Hall at Otago University way back in 1893. It was a male only college until 1983 when females were finally admitted. Girls now comprise approximately 50% of the students based there. Apart from its place in history, Selwyn College, the university’s smallest Hall of Residence, is known around the world for the Selwyn Ballet. This all male ballet troupe first performed in 1928 as a parody of popular London musicals of the time. 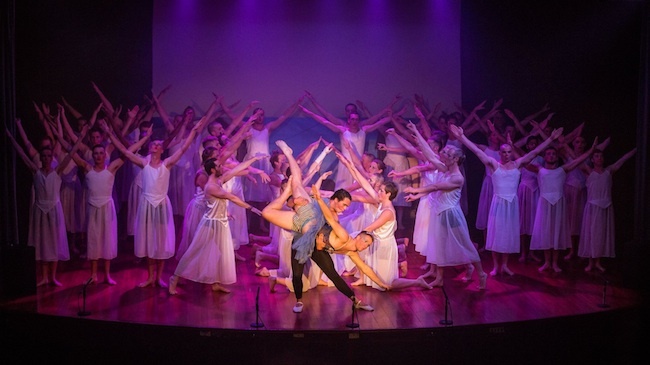 It quickly evolved into a parody of classical ballet and by 1937, was a well established tradition, performing as the highlight in Otago University’s annual Capping Concert. First year boys are expected to dance in the ballet. It’s a strange, yet cherished ritual that few turn down. In fact the Selwyn Ballet, perhaps the most unique ballet group in the world, is now 88 years old, and predates the official New Zealand Ballet Company which wasn’t formed until 1953. Devon Latoa was playing the ‘Leading Lady’ in the upcoming Swan Lake. The 19 year old lad also had the job of organising and co-ordinating the ballet events. He arranged for the boys to perform at the start of the South Africa-New Zealand 3rd rugby test that year. The Rugby Union was delighted to have them. However, there was a mixed reaction from the crowd. “There’s great respect among Dunedin people for the ballet.” he told me. “ People from elsewhere are bewildered and confused though.” he added with a smile. Have a look at the boys performing in this unique ballet presentation on a sports field – a world first! During the 1980s the Capping Concert lost popularity, and with it, the Selwyn Ballet also fell from favour. It was a time when attitudes changed and variety shows were deemed old fashioned. However, interest in the concert was re-kindled at the start of the new century and today, it’s a highlight of the university year and a popular entertainment event for the 120.000 people of Dunedin. 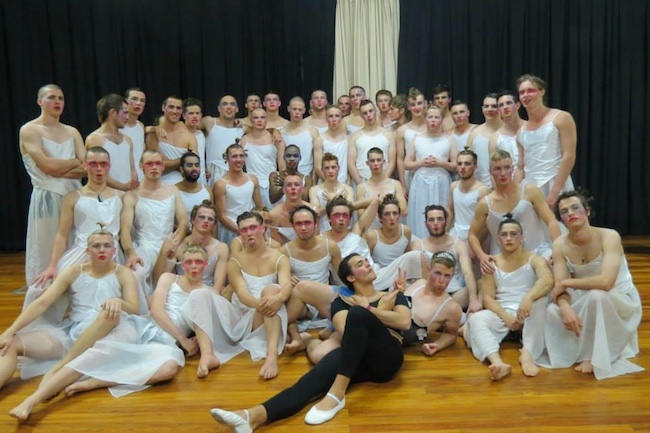 The star of the show is the performance of the boys in the famous Selwyn Ballet as they tip toe across the largest stage in the city. 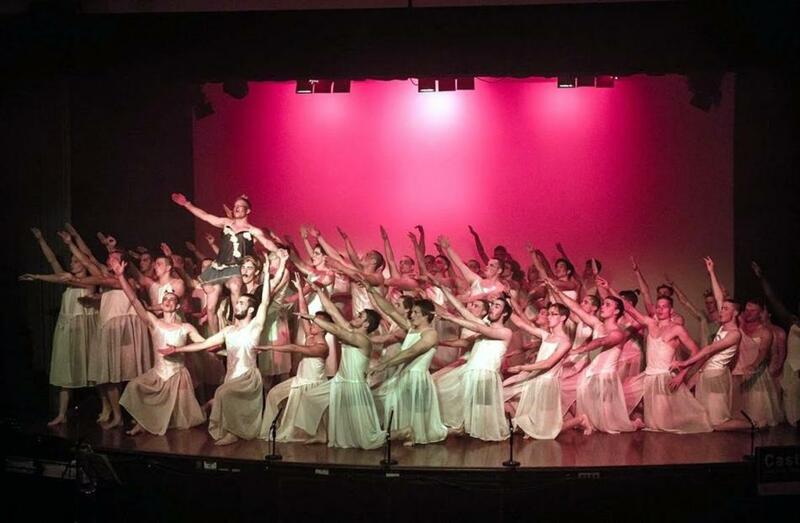 The ‘cygnets’ and ‘gazelles’ draw enthusiastic cheers as they do their unique take of Swan Lake, carrying on the dancing tradition when previous performances included Can-Can in 1938, Scheherazade in 1940, Swan Lake in 1949 and Faust in 1955. The makeup, silly hairstyles and crumpled tutus, add up to little, but once the enthusiasm, energy, history and uniqueness is added, a wonderful synthesis happens. To put it another way—the Selwyn Ballet happens! Selwyn College has another side. Tutus and makeup are replaced with football gear, boots and mud as the boys take part in ‘The Leith Run’. Boys will be boys. The Run was inaugurated in 1935 as part of Selwyn College’s initiation festivities. The Selwyn College girls commence the Leith Run by carrying a bath to the Dunedin Botanic Gardens just north of the university campus. From there, male students dressed in football gear or less, carry the bath in the cold water of the Leith River which runs through the campus. 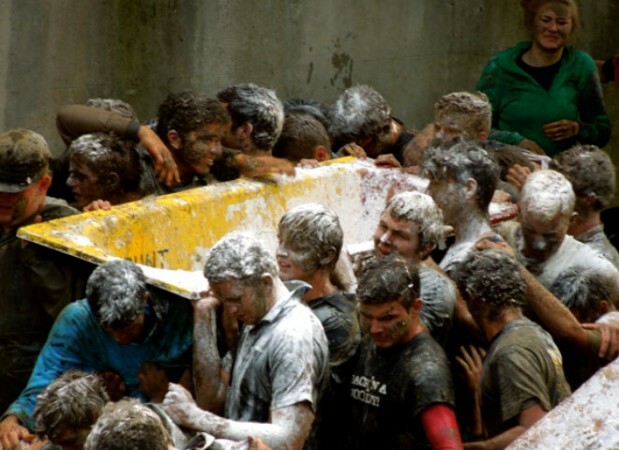 While ‘the bath runners’ undertake this difficult task, they are pelted with eggs and flour bombs by fellow students and ex-residents of Selwyn College until they reach their destination further down the shallow river in front of the university’s iconic clock tower. 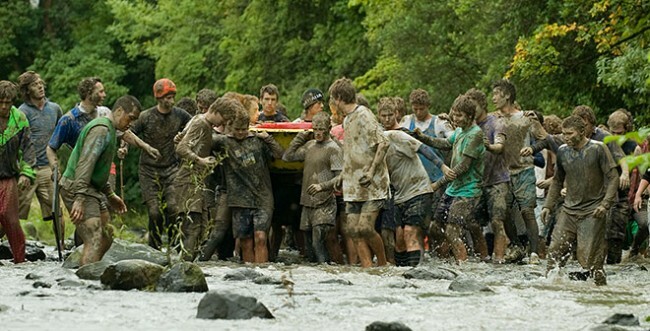 There is a slide show of the “Leith Run” to view here. A muddy tug of war follows after everyone pitches in to bring the bath ashore. This energetic ceremony, the complete opposite to ballet, has now become Selwyn College’s other treasured tradition symbolizing helping with a shared load. Like the Selwyn Ballet, the “Leith Run” also builds camaraderie where students develop an understand of the importance of mutual support and friendship. Most ‘exies” keep an interest in the college’s activities for many years and remember their time there with a deep fondness.